Back and neck pain is a difficult and growing concern for patients and medical professionals around the world. According to the existing medical literature, 80 percent of the world population suffers from back or neck pain at some point in their lifetime. At any given time, 12 to 18 percent, if not more of the world population is actively suffering from these problems. Technological advancements have brought many conveniences into our daily lives, while at the same time negatively affecting some of the very vital functioning aspects of our bodies. Some gadgets for instance have put a burden on our back, neck, nerves and even the cells of our bodies. In the case of using the phone, computers and notepads, we are continually contorting our bodies. Such habits have led to the development of ‘modern’ disease conditions such as the “text neck syndrome”. What is even more concerning is that specific degenerative conditions caused by the continual usage of mobile phones, TV, laptops, and tablets, can be noticed in children at a very young age. In other words, children are ending up with diseases which once upon a time only affected “old people”. On an MRI or x-ray we can see the degenerative processes, include changes in the normal spinal curvatures, and disc deterioration between the vertebrae of the spine. This can result in mild to severe back and neck pain, not to mention other more severe conditions. Signs of nerve compression like numbness (pins and needles), burning, or “sharp electrical” like sensations can be felt in the affected part of the body. It is not unusual to see In more advanced cases, even muscle weakness at a young age. A variety of factors influence the development of back and neck pain. Risk factors such as incorrect posture, poor ergonomics, obesity, sedentary lifestyle, sudden acceleration and deceleration injuries, long driving hours, poor nutrition (fast food, fizzy drinks), worn out mattresses, sleeping on the stomach, high pillows, and emotional and psychological stresses can lead to degenerative processes. Consistent pain is an alarming sign that something in our bodies is not right. Regardless of its intensity, any persistent pain that progresses over the course of one week should be taken seriously. Conventional use of pain killers to mask the pain is an inefficient treatment solution that doesn’t heal the underlying cause of the pain and has its own potential serious side effects. Instead, every patient experiencing back and neck pain should seek an early and thorough consultation with a licensed medical professional. A proper diagnosis and subsequent treatment plan to address the source of pain is critical. According to Dr. Khan, a specialist with a research focus in pain management and rehabilitation, “most of the cases of back and neck pain, headaches, disc damage, nerve compression (like sciatica), spinal stenosis, and facet joint arthritis have been frequently seen to be a sequel to an acquired malalignment in the spine and secondary to ligamentous injuries (stretching/tearing and loosening) of varying extent”. “Normally, such problems are managed by symptomatic treatments that don’t make a significant improvement and many times even worsen the process of deterioration, with some cases ending up with the inevitable need for surgical intervention,” he continues. Understanding the need of targeting the underlying cause of chronic back and neck pain, our team at KKT Orthopaedic spine centre have come up with an advanced and unique treatment that not only treats the pain but identifies the root of the problem. KKT is a globally available and internationally certified treatment (from organisations such as FDA, etc.) pioneered by Dr. Aslam Khan. Dr. Khan and his exquisite team of doctors collaborated with leading Canadian universities to come up with this unprecedented way of therapy for chronic back and neck pain. The treatment uses specific SINE wave frequencies to stimulate the spine in numerous ways. These waves not only help in realigning the spine and achieving a more biomechanically stable body that prevents ongoing damage, but also have been experimentally proven to enhance the gene upregulation of specific proteins required for healing of damaged tissues like discs and ligaments. The KKT treatment is a non-invasive and painless treatment that doesn’t require medication or surgery. Our KKT Bahrain team feels very fortunate for the ability to help thousands of patients suffering from chronic pain to get back their lives, medication-free and without a need for surgery. All this in the past year of being open in Bahrain. 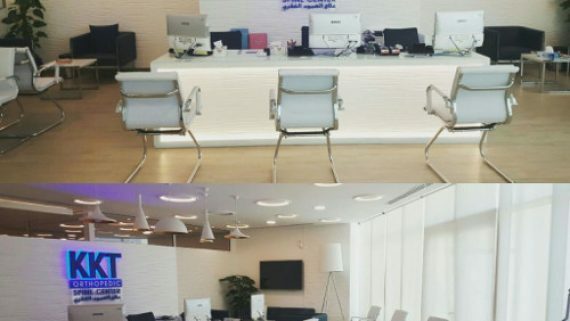 KKT Bahrain has also had the honour to serve not only the people of Bahrain, but also a considerable number of regional and overseas patients to get back to a pain-free life. Our team of doctors and our staff is striving to deliver the highest health care standards to our patients, and stay committed to this unique mission. OmanTV invites Dr. Aslam Khan for a brief talk about KKT treatments. 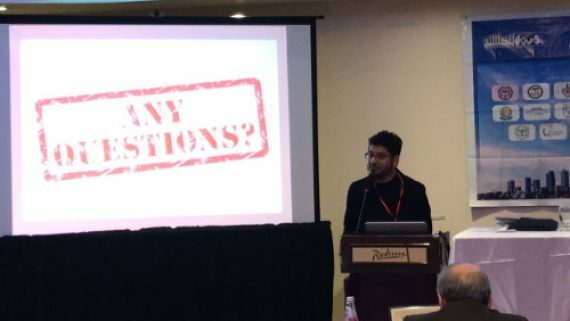 Dr. Khan recently addressed leading orthopedic surgeons from around the world at the International Surgery and Ortho Conference in Toronto Canada. The aim of this conference was to provide insight about the latest advancement and treatment modalities in the field of Bones, Joints, and Ligaments of the spine. The prestigious event was chaired by Dr. Seyed M. Rezaian from the California Orthopedic Medical Clinic in USA and Dr. Anthony Young from Desert Institute for Spine Care in the United States. The two day conference discussed the latest updates and issues regarding the field of spinal care with a focus on exploring new concepts in idiopathic back pain. Dr. Khan was invited to discuss the necessity of novel treatments, such as the KKT Treatment, to be incorporated into the back and neck pain treatment algorithms. Dr. Khan gave a compelling look at the convincing evidence showing how the KKT waves induces beneficial biomechanical and cellular changes that can address the core issues in back pain. The presentation was highly lauded by the participants which included renowned orthopedic surgeons and specialists.